Start: Antigua, West Indies Monday 22 February 2016 Organised by The Royal Ocean Racing Club in association with Antigua Yacht Club Course: Approx. 600nm non-stop around 11 Caribbean Islands. 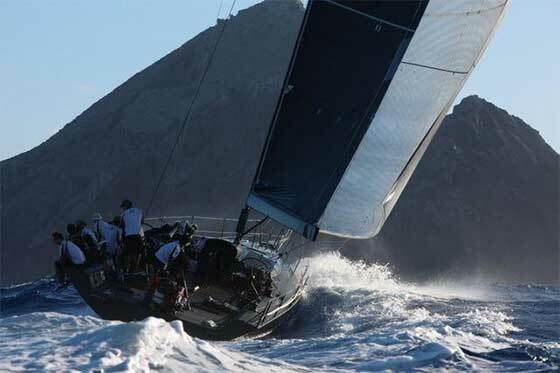 "The RORC Caribbean 600 is attracting some of the world's best yachts. Top professionals who have done the race before have often found it a tougher race than they had anticipated," comments Mike Broughton, navigator for the 8th edition of the RORC Caribbean 600 on the brand new Baltic 115, Nikata. "With tropical heat and humidity, combining with tradewinds and unremitting waves, the conditions are physically demanding and there are a lot of sail changes, especially in the first 24 hours." Mike has competed in 16 Fastnets, 10 Sydney Hobarts and 8 Middle Sea Races. 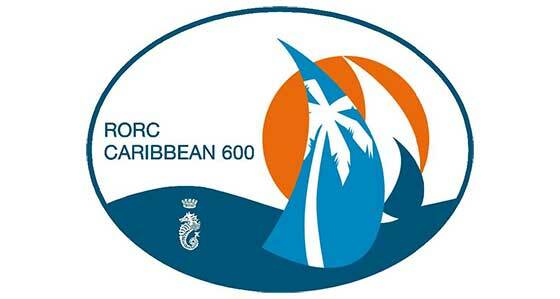 Mike will be taking part in his sixth RORC Caribbean 600 and gives a detailed account of the course for the RORC Caribbean 600. You are straight into the action right from the start just outside English Harbour with a beat up to Green Island. With land on the left bending the wind, it makes a lot of sense to stay close to the cliffs; there is also less adverse current inshore. With about a 125º true wind angle, the leg to Barbuda is fast with reaching sails. There are two banks to watch out for; Three and Four Fathom Bank, which are just to the left of the rhumb line which is generally the best place to be to anticipate the wind freeing as the wind bends around the southern side of Barbuda, about four miles prior to the mark. Barbuda is the only island we race round that is flat, so you won't see it until about six miles off. 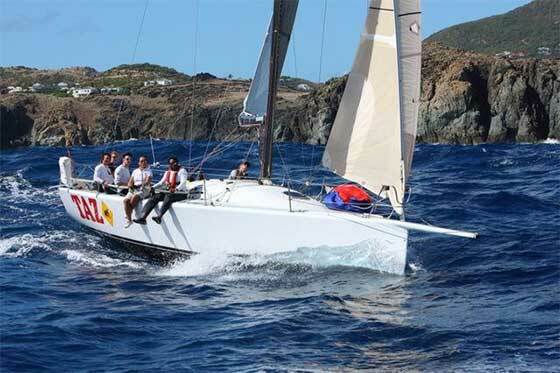 After gybing at the Barbuda mark, it should be a broad reach to the bottom of Nevis. This year the trades have tended to be a bit lighter and are usually lighter still around sunset and sunrise. The approach to Nevis can be close to the south, but care must be taken not to get into the wind shadow on the leeward side. Nevis is an even shaped cone rising to over 1000 metres. I have seen a 50 footer wallowing in no breeze in the wind shadow for about 20 mins, whilst other boats flew past 400 meters further out doing over 10 knots. There are two wind shadow effects passing to the leeward of St.Kitts and a further one passing Sint Eustatius. A safer track is to go further west, but you will be sailing more distance, so getting that balance right is the key. Sint Eustatius has a lot of lights around it from oil tankers as it has a large transhipping depot there. Once you get to Saba, the wind shadow is probably the most significant of the early part of the race; get too close at your peril, but don't give up too much windward gauge. Plan to pass close to Diamond Rock. This can be a tough beat. Generally speaking it works to go north of track to get out of the worst of the current and sea state in the lee of St Barts. There are plenty of rocks around St. Barts to avoid, especially on the southern and eastern coast. Be aware of faster boats on the course who will be heading south, which can be hard to see with background lights from St. Martin. Many of them will also be flying A-Sails making it difficult for them to see you fine on their starboard bow. Prudent sailing is required as pass close to a lee shore and it is worth using the AIS to help locate converging boats on this tricky bit of the course. Beware going too close to the cliffs as the wind is very light as it detaches from the surface. As you bare away around Ile Toc Vers, you must leave all the rocks of St. Barths to Port. Along the leeward side of St. Martin, the wind shadow can have an effect but it should be a fast broad reach up to Long Bay. You don't want to go too far offshore as you will be hardening up rounding Long Bay into the Anguilla Channel. Also be aware that the chart depth is not totally accurate as you enter the Anguilla Channel and there is also a rock off Baie aux Prunes. 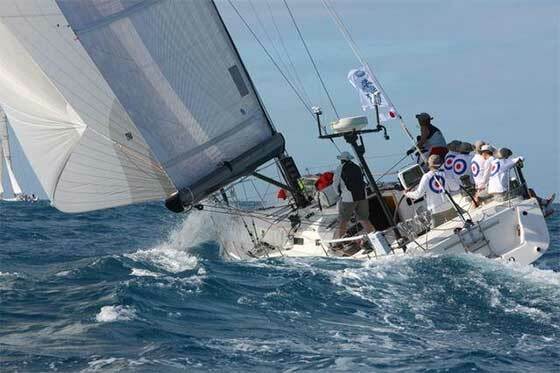 After dousing your spinnaker at Long Bay, be aware of the strong westerly going current. The north shore of St. Martin often pays before you finally bare away at Tintamarre and aim for St Barths once again. The first 20 miles to St. Barths is a tight angle, so it is not a huge bare away but there you will crack off at St. Barths and go south for long 140-mile reach. Montserrat is en route but going west of it is quite risky. This route does give you a better angle coming into Iles des Saintes, but you have to sail more miles and risk the big wind shadow and also beware of the prohibited area, particularly on its south west side. As you approach Guadeloupe, you tend to get lifted at first, then you have the battle of the Guadeloupe wind shadows as the wind converges round the north and south sides, and also comes from on high over the top of the high island. It's worth looking at a contour map to understand how the wind shadow plays out on this crucial part of the course. There can be wind close to the shore at night, but certainly not always. The one thing you can say though is that there is always a wind shadow! This beat is one of the toughest parts of the course with headwinds curving around the north of Marie Galante and the south east of Guadeloupe. Rounding La Desirade you will probably experience the strongest current of the whole race. It is always nice to bear away and head north here. With about 135º True Wind Angle, this should be an open ocean spinnaker leg, a feel good leg after the beat with the boat picking up speed, eventually getting ready for the gybe at Barbuda with the same issues as last time. A spinnaker run to Redonda, there can be some big wind variations as you pass Antigua. There can be a little bit of a wind shadow at Redonda. As you round Redonda at beat for the finish, the chart shows Pinnacle Rock, just to the south east but I have never seen it. The last leg is usually a dead beat and generally speaking, north of the rhumb line gives flatter water and lifting pressure coming from the north of Antigua. Watch out for the shallows off the west coast, especially Cades Reef, but quite often the shore works for this last leg. Antigua is in sight for much of this leg but it always seems to take a bit longer than you think, so there are still gains to be made on the final leg to finish. 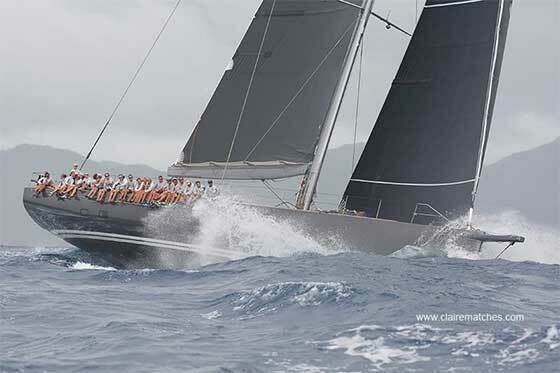 Thousands of spectators will gather at Shirley Heights to watch the impressive 66-boat fleet begin the 8th RORC Caribbean 600. Hundreds of thousands more will watch the race unfold via video, photographs, race reports and blogs from the boats. All of the competing yachts will be fitted with YB Trackers.